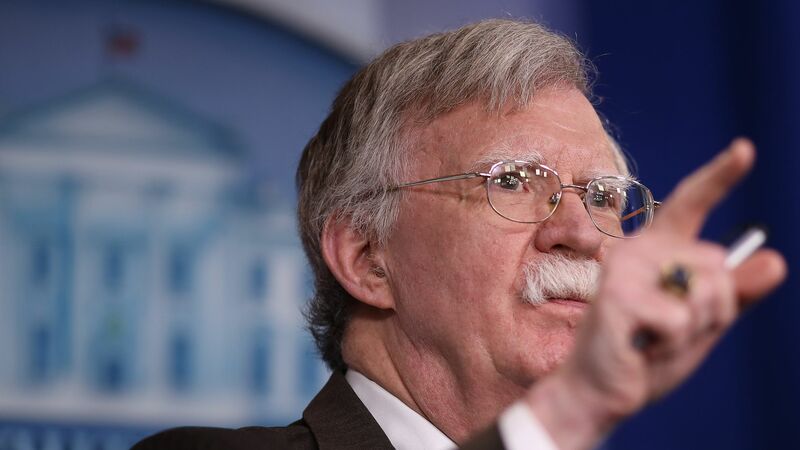 National security adviser John Bolton released a statement on Friday condemning Russia's military deployment in Venezuela, cautioning that the U.S. will protect its interests in the Western Hemisphere and consider such actions a "threat to international peace and security in the region." The state of play: Earlier in the week, two Russian military planes touched down in Caracas with supplies and military advice for embattled Venezuelan President Nicolás Maduro's regime, per the New York Times. The backdrop: Maduro's government announced on Thursday that it is barring opposition leader and National Assembly leader Juan Guaidó, who is backed by the U.S. and other nations as Venezuela's rightful president, from holding public office for 15 years. Bolton said in January that any violence against the National Assembly or Guaidó "would signify a grave assault on the rule of law and will be met with a significant response." The Administration condemns Nicolas Maduro's continued use of foreign military personnel in his attempt to remain in power, including the introduction of Russian military personnel and equipment into Venezuela. Maduro will only use this military support to further repress the people of Venezuela; perpetuate the economic crisis that has destroyed Venezuela’s economy; and endanger regional stability. We call on the Venezuelan military to uphold its constitutional duty to protect the citizens of Venezuela. We strongly caution actors external to the Western Hemisphere against deploying military assets to Venezuela, or elsewhere in the Hemisphere, with the intent of establishing or expanding military operations. We will consider such provocative actions as a direct threat to international peace and security in the region. We will continue to defend and protect the interests of the United States, and those of our partners in the Western Hemisphere, which are rooted in a shared respect for liberty, security, and the rule of law.